Emissions Regulation: What does this mean for growers and farmers? Challenger Tractors presents e3 to meet reduced emissions standards. The EPA regulates emissions produced by a variety of sources. 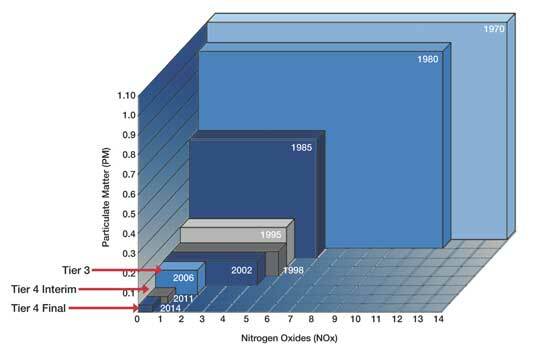 The chart below shows the amount of particulate matter (PM) and nitrogen oxides (NOx) for the corresponding tiers and the years when those tiers become effective. This chart applies only to engines producing 175 - 750 HP. PM is easily defined as the black smoke you see coming out of an exhaust pipe. That smoke is essentially unspent fuel. It is a major contributor to smog and a variety of respiratory ailments. NOx is a large contributor to ozone depletion and when combined with water (rain) can form Nitric Acid (acid rain). Tier 3 became effective in 2006. Most engine manufacturers used exhaust gas recirculation (EGR) in conjunction with other technologies to achieve Tier 3 compliance. EGR was used because it did not have significant effects on vehicle design and was the most cost-effective solution for both manufacturers and customers. The problem with EGR is its effect on fuel consumption. Customers quickly realized that even though the cost of products equipped with Tier 3 engines was not significantly different from the cost of previous models, the operational costs were higher due to fuel consumption and service intervals. The year an engine or vehicle is produced determines which Tier it will be regulated by. For instance, in March of 2011, if a dealer or customer rents, leases, purchases, or takes possession of a tractor built in 2010, that tractor will still be in compliance because of when it was built. Rest assured that all products delivered by AGCO will meet all state and federal regulations at the time of delivery. Looking forward-what is the next step? AGCO recognized that the market needed a solution that helped customers' bottom lines and met current and approaching regulations. We launched a new series of HHP fixed-frame tractors in Atlanta, GA in February 2009. The tractors were introduced with two engine options: SCR and EGR. These tractors and engines are rated only for Tier 3 emission compliance. So why did we introduce this technology now? The answer: e3! ► Growers need a balanced solution: Investment versus operating costs. In the coming weeks, Ring Power's agricultural division will continue to discuss EPA Tier IV Emissions and Challenger's e3 initiative. Continue reading other articles and we'll reveal how farmers can comply without compromise and without loss of tractor performance.